If you need help understanding the cause of a hearing problem, take this opportunity to reserve your chance to receive a free video otoscope exam at our Hearing Health location in Brockport NY. A hearing instrument specialist will use a tiny video camera to look inside your ear canal. This exam is free and completely painless. Availability is limited. Call our store today for more details and to reserve your spot. Robert spent 14 years after graduating from Erie Community college, working as a dedicated International Manager for a medical manufacturing company. Robert pursued a new career path where he could make a difference in people’s lives. When the position of Hearing Instrument Specialist opened in Brockport, this was the opportunity he was looking for and in turn, has become a great asset to Hearing Health LLC. Robert understands how devastating hearing loss can be, as his father struggled for many years with high pitch voices unable to hear his young grandchildren. Robert witnessed the positive transformation his father went through after using hearing aids, and how his quality of life improved dramatically. He realized it’s not just the person with hearing loss that is affected, but everyone in their lives. Robert treats his patient’s like family with first-class care. New technology and programming emerges every year and is always ready to provide optimal service. He enjoys helping people understand their hearing loss and the many ways to improve it through routine testing and consistent use of quality hearing aids. Robert lives in Cheektowaga with his wife and two children. 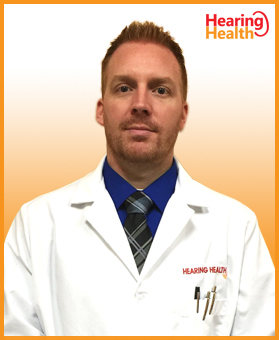 Robert is a hard-working dedicated specialist committed to the patients of hearing health and there hearing issues. He looks forward to helping the entire Brockport area and beyond.